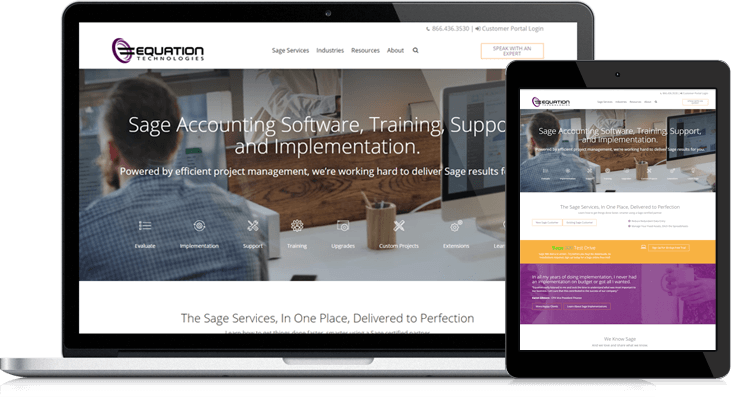 Equation Technologies has been a go-to firm for Sage accounting software since 2001, not only selling the product but also providing installation, training, implementation, maintenance, upgrades and customization of several Sage products. Equation Technologies had been a previous customer of LyntonWeb, making it easy for them to choose us when they saw our name in the HubSpot database of HubSpot agencies. Equation Technologies wanted to get back on track with higher traffic numbers, with the aim of increasing visitors and doubling leads. As it stood, most leads were coming from microsites associated with Sage software rather than the company’s own site. LyntonWeb got to work, redesigning a website that doubled as an effective marketing tool. Setting up the site on the HubSpot platform instantly made it incredibly easy to manage and update, with a consistent theme and templates that would eliminate a disjointed feel going forward. New templates added to the crisp, clean and consistent look, with LyntonWeb providing on-page organization of content. We devised a content strategy that would appeal to Equation Tech’s target audience. These are companies evaluating or already using Sage and seeking a partner to assist them with specific services or support requests. In addition to presenting a unified, comprehensive rundown on what Equation Technologies is and does, the new site serves as a valuable resource for anyone using Sage software. The resources section is set up to attract individuals who need help with Sage and may benefit from Equation Tech’s specialized knowledge. LyntonWeb also provided a few website adjustments, blog updates and set up breadcrumb trails after the website’s launch.